The ever increasing worldwide statistics of bone disorders and related diseases, in particular in aging or obese populations as well as those with poor physical activity, have raised alarming concerns as studies suggest the incidence of bone disorder to more than double up by 2020 globally [1, 2]. The current approach towards treating bone defects, with the aim of repairing or regenerating bone, is the use of bone grafts (autografts or allografts) [3-5]. So far, autografts have been considered as the “gold standard” for the repair of bone defects due to their many characteristics including their histocompatibility, non-immunogenicity and osteoinductive/osteocunductive potentials [2, 3]. However, harvesting autografts from patient’s iliac crest, as a second procedure, is considered expensive and risky (leading to bleeding, inflammation, infection and/or chronic pain in some cases) [6-8]. There are also extensive reports on significant donor site injury and morbidity following this procedure [9, 10]. To overcome such obstacles, bone tissue engineering; in particular engineering of synthetic bone graft substitutes, has been recognised as an alternative to the traditional methods. This is mostly because of their unlimited supply, eliminated risk of disease transmission and relatively low cost [2, 11, 12]. Bone tissue engineering could also lead to patient specific design and manufacture of implants, prosthesis and bone related devices [12, 13]. The principal of bone tissue engineering is based on using natural or synthetic scaffolds that are biocompatible and similar (mechanically, chemically and biologically) to the native extracellular matrix (ECM) of human bone. In order for bone to be repaired or regenerated, depending on the design, such scaffolds are seeded with cells with osteogenic lineages and in some cases incorporated with osteogenic and/or vasculogenic growth factors, or inorganic biomaterials such as calcium phosphate, hydroxyapatite or bioglasses, to promote bone growth. An ideal scaffold, depending on its application, should be biocompatible, bioactive, non-thrombogenic and anti-inflammatory. It should also be porous with interconnected open pores of suitable sizes (macro-pore size >100 mm, micro-pore size <20 mm), to promote the ingrowth of osteogenic cells in vivo [12, 14, 15]. Furthermore, it should have compatible mechanical and controlled degradation kinetics (if necessary) with the specific application of bone tissue engineering [2, 12]. These characteristics are normally compared to those of either cortical or trabecular bone, depending on the type of bone defect (Table 1). In addition to the above characteristics, ideal bone tissue engineering scaffolds, as already mentioned, should closely resemble the composition of bone ECM, which naturally consist of collagen (predominantly type-1 collagen), carbonated apatite mineralites, and nanohydroxyapatite (nHA). Table 1. Structure and mechanical properties of natural bone. In the search for the ideal substitute material for natural bone, various materials including; metals, ceramics, polymers (natural and synthetic) have been investigated. The main disadvantages of metals and ceramics are that they lack degradability under biological conditions and that their processability is extensively limited as opposed to polymers, which offer wide design flexibility [16, 17]. Hence, biopolymer composites and nanocomposites have been investigated as the best approach to mimic natural bone properties and create an ideal artificial scaffolding for bone regeneration and repair. Chitson (a linear polysaccharide produced by the deacetylation of chitin, a naturally occurring polymer) based composite biomaterials have been one group of such materials that have attracted considerable attention for bone tissue engineering purposes, owing to their pore forming ability, binding capacity with anionic molecules, antibacterial activity and biodegradation . However, on their own, they generally lack the necessary mechanical properties for bone tissue engineering application. Collagen based nanocomposites have also been greatly investigated for bone tissue engineering applications. Collagen nanofibrous structure (50-500 nm) can have improving effect on cell attachment, proliferation and differentiation for bone regeneration. However, the natural and rapid degradability of this family of materials limits their applications . Other naturally occurring materials used for bone tissue engineering include gelatine- and fibroin-based nanocomposites. Like the collagen family, these natural polymers also have limited applications due to the nature and rate of their degradation. Therefore, a thorough search of the literature reveals that synthetic polymers have been extensively studied as the basic materials for the purpose of fabricating tissue engineered scaffolds with potentials to promote in vivo bone ingrowth and subsequently repair or regenerate bone to replace missing tissue, as they come in various types including degradable and non-degradable, can be easily modified and also mass-produced [20-23]. Examples of synthetic polymers include, but are not limited to, polycaprolactone (PCL) [24, 25], poly (lactic-co-glycolic) acid (PLGA) [26, 27], polyamide, polyvinyl alcohol (PVA) [28, 29], polyurethane (PU) [30, 31] and polyetheretherketone (PEEK) [32, 33]. In detail investigation of these polymers and others of similar nature is beyond the scope of this article. However, Liu and Ma (2004) have done a comprehensive review on this topic . Although synthetic polymers can offer wide advantages, including controlled degradation, biocompatibility, mechanical stability and many more, they lack osteoconductivity or osteoinductivity. Synthetic nHA, due to its close chemical similarities to that of the natural bone, has attracted extensive research focus as a potentially suitable filler for synthetic polymers to create nanocomposite materials for bone tissue engineering [20, 34, 35]. Creating nanocomposite materials from incorporation of nHA into synthetic polymers could combine the advantages inherited by each of these components. Therefore, the aim of the present article is to review and update various aspects involved in incorporation of synthetic nHA into synthetic polymers, in terms of their potentials to promote bone growth and regeneration both in vitro, in vivo and consequently in clinical applications. To this end, the most recent findings and research on this topic have been investigated and discussed. nHA is the main inorganic compound of the natural bone, which exhibits a hexagonal crystal structure, and has a chemical formula of Ca10(PO4)6(OH)2. nHA is produced using various methods such as mechanochemical synthesis, combustion preparation and various wet chemistry techniques  and comes in variety of forms and shapes including nanofibers, nanorods and nanoflakes [36, 37]. However, for the first time, nHA (nanocrystalline HA; particle size ~ 20 nm) was synthesised using calcium nitrate and diammonium hydrogen orthophosphate as precursors by solution spray dry method . nHA has been used in various aspects of bone tissue engineering research due to its stablished biocompatibility, osteoconductivity, bone integration abilities, slow degradation, and non-cytotoxicity [18, 39, 40]. Furthermore it has been stablished that, nHA, due to the size of its nanoparticles and consequently increased surface area as well as its improved sinterability and enhanced densification (compared to HA powder), has increased fracture toughness and a stronger ability to bond with proteins . Other physiochemical characteristics of nHA such as its high melting point (does not melt in human body), its hard and wear resistance as well as its ability to resists surface reaction with certain fluids in the body, render nHA an interesting bioceramic material for bone tissue engineering (Table 2). However, properties such as its lack of flexibility and its brittleness make it difficult to form nHA into specific shapes for bone tissue engineering on its own . These limitations could be overcome by incorporation of nHA into a suitable polymeric scaffold . Table 2. Physiochemical characteristics of synthetic nanohydroxyapatite. In theory, most types of polymers can be incorporated with nHA. However, not all of them are suitable matrixes for this purpose. In order to achieve a well dispersed nHA/polymer nanocomposite, various factors should be considered. A critical issue to pay attention to in developing nHA/polymer nanocomposites is the interfacial strength between the filler (nHA nanoparticles) and the polymer. A suitable polymer should have a chemical bonding composition that supports adhesion between its particles and those of nHA . Otherwise, the lack of adhesion can lead to early failure of the two incorporated phases and hence affect the mechanical properties (in particular tensile strength) of the construct. Furthermore, the wettability of a polymer can play a crucial role in successful incorporation of nHA by affecting the type and strength of bonding and adherence of the nHA surface and the polymer . This phenomenon is determined by the polarity and available polar groups of the polymer, which can render the polymer hydrophobic or hydrophilic. In addition, the method of incorporation of nHA into the polymer could have great impact on the properties of the final construct. The methods of delivering nHA into a polymer matrix can be divided into two main categories; thermo-mechanical methods and physico-chemical methods [45, 46]. The former methods use conventional plastics processing techniques to impregnate a porous polymeric matrix with nHA. Examples of such methods are compounding, compression or injection moulding. Physico-chemical methods, on the other hand, use either co-precipitation of nHA crystals in situ into the polymeric matrix or use a solvent as a dispersion solution for nHA before being added to the polymer. Both thermo-mechanical methods and physico-chemical methods have been shown effective for nHA incorporation into polymers, however, various limitations such as thermal degradability of heat-sensitive polymers caused by moulding temperature and pressure, solvent toxicity, and gelation rate exist . Ideally the rate of scaffold degradation should be compatible with the rate of replacement of bone produced from cells. This is a crucial factor to be noted when selecting or designing a suitable scaffold for bone tissue engineering purposes as well as to ensure long-term success of the tissue engineered scaffold. Scaffold degradation can have great impact on three-dimensional cell growth and angiogenesis; two crucial factors involved in bone tissue regeneration . Furthermore, the rate of degradation of construct could affect the mechanical properties of reconstructed bone negatively, an event that could consequently lead to failure of bone regeneration and its integrity, especially in the cases of load-bearing bone tissue engineering applications such as spinal fusion implants . Depending on the nature of the selected polymer (i.e. slow degrading or fast degrading polymer), nHA/synthetic polymer scaffolds would have different degradation profiles and hence different ability to allow for bone regeneration and remodelling. Generally, the process of nHA/synthetic polymer scaffolds degradation takes places either by dissolution of the scaffold and subsequent the take up of the fragments by phagocytosis or macrophages or through osteoclasts which are multinucleated monocyte-macrophage derivatives that degrade bone and use the fragments to manage extracellular calcium activity [48-50]. A part from the nature of the synthetic polymer various other characteristics of the scaffold including the crystal size of nHA, the surface roughness and topography of the scaffold could also impact the rate of degradation [48, 51-53]. The size of nHA crystals could determine the specific surface area (SSA) to volume ratio of the scaffold and consequently effect the scaffold solubility and resorbability . A higher surface area to volume ratio may significantly increase solubility of the construct and render it more resorabable . Furthermore, degradation rate could be affected by the Ca/P ratio by which solubility and degradation rate of the scaffold decreases with an increase in the Ca/P molar ratio of nHA [54, 56]. Vast number of studies have been conducted and published on the process and rate of degradation as well as the cytotoxicity of degraded micro- and nano-particles of nHA/synthetic polymers both in vitro and in vivo. Dong et al. investigated porous nHA/PU (30:70 wt%) scaffolds from castor oil, for their degradation rate and biocompatibility and reported that their scaffolds were non-cytotoxic and degradable . In this study, scaffolds were seeded with bone marrow stromal cells (BMSCs) after soaking in simulated body fluid (SBF) for 4 weeks. In vivo study was conducted on healthy SD female mice for a 12 week period. Infrared spectroscopy of n-HA/PU scaffold and scaffold soaking in SBF for 4 weeks showed that the long carbon chains of castor oil break into shorter chains, therefore, indicating that urethanes degrade through chemical breakage of castor oil followed by the hydrolysis of urethane bonds joining the hard and soft segment. Authors further investigation of nHA/PU scaffold revealed that in vivo degradation of the construct was mainly due to the enzyme digestion of n-HA from monocyte-derived macrophage (MDM) and the hydrolysis of PU (Fig. 1). Han et al. also investigated the difference in degradation rate, affected by specific surface area, of a biomimetic nanofibrous poly(L-lactide) scaffold strengthened by nHA particles and reported that the nanofibrous poly(L-lactide) (NF-PLLA) had a significantly higher SSA (34.06 m2 g-1) compared to that of poly(L-lactide) (PLLA) scaffolds (2.70 m2 g-1) with platelet structure . Furthermore, incorporation of nHA increased the SSA of the scaffold. Their research revealed that both NF-PLLA and nHA/NF-PLLA had a faster significantly degradation rate, due to their much larger SSA, compared to poly(L-lactide). Similarly, Diaz and Puerto (2015) examined the effect of bioactive nanoparticles on the in vitro degradation of nHA/poly(L-lactide-co-ε-caprolactone) (nHA/PLCL) composite scaffolds and found that the rate of degradation was significantly dependent on the concentration of nHA . At 10%, 30% and 50% of total polymer mass the authors incorporated nHA into PLCL and observed that the rate of degradation of the scaffolds was significantly slower with the increase of nHA content compared to lower nHA concentrations and that of pure PLCL (Fig. 2A & C). The authors also observed higher water absorption capability of the nHA particles at higher nHA concentrations and consequently affecting the degradation rate (Fig. 2B). This phenomenon can be explained by the ability of nHA nanoparticles to absorb water molecules penetrating the solid structure of the scaffold and hence slowing the degradation. Fig. (1). Degradation profile of nHA/PU scaffolds: A) Photo macrograph image of the porous n-HA/PU scaffold; B) Scanning electron microscopy imaging of the porous n-HA/PU scaffold (1) and after 4 weeks of soaking in SBF (2, 3); C) Inferred spectra of n-HA/PU scaffold (1) and after 4 weeks of soaking in SBF (2); D) Histological imaging of n-HA/PU scaffold (denoted as P) 12 weeks after in vivo implantation (R denotes muscle tissue, H&E stained). (1) x 40, (2) x 400 . One of the most interesting characteristics of nHA is its osteoconductivity; the ability to facilitate bone repair and bone growth on a surface (scaffold) or in other words to promote osteoconduction. This interest is mainly due to the fact that most synthetic polymers, on their own, have low surface wettability (i.e. they are highly hydrophobic)  and on their own are not favourable for bone tissue engineer application as they lack the ability to promote osteogenic cells adhesion, proliferation and differentiation [60-62]. Furthermore, osteogenic cells have a higher apoptotic rate on such hydrophobic surfaces than on those with higher surface wettability. This is where incorporation of nHA into synthetic polymers can play a crucial role, in facilitating bone growth, by rendering the scaffold surface more or highly hydrophilic (depending on nHA concentration). Another factor critical in bone formation is the ability of the scaffold to evoke tissue response. However, as most synthetic polymers have a bioinert surface they do not provide the necessary bioactive function for bone regeneration . In the absence of nHA, synthetic polymers have limited abilities and are only able of promoting minimal and disrupted bone regeneration. This also could be overcome by incorporation of nHA into synthetic polymer as it has the necessary bioactive functions for bone formation and hence promoting tissue responses. nHA/synthetic polymer scaffolds bond with the host tissue and promote the formation of a bone-like apatite layer on the surface of the implant [60, 63, 64]. Fig. (2). Investigation into the effect of nHA nanoparticles on the degradation of PLCL: A) Profile of Mw versus degradation time for PLC/nHA composite scaffolds; B) Changes of water absorption versus degradation time for PLCL/nHA composite scaffold; C) Scanning electron microscopy imaging of PLCL surface morphology: (a) PLCL after two weeks of in vitro degradation, (b) PLCL/10 wt% nHA after four weeks of in vitro degradation (c) PLCL after six weeks of in vitro degradation, and (d)) PLCL/50 wt% nHA after four weeks of in vitro degradation . Increased osteoconductivity of nHA/synthetic polymer scaffolds has been a promising avenue to enhance and optimise bone grafts and implants for the purpose of bone tissue engineering. For instance, Tong et al. investigated the in vitro biological effect of carbonated nHA (CHA) on poly(hydroxybutyrate-co-hydroxyvalerate) (PHBV); a synthetic polymer which lacks osteoconductivity that is optimum for bone tissue engineering . The human osteoblast-like cell-line (SaOS-2) was cultured onto both types (electrospun PHBV and CHA/PHBV) of scaffolds and their morphology, proliferation and alkaline phosphatase (ALP) activity were measured in a period of 14 days at different cell culture time points. The authors reported that after 14 days of culture, although both types of scaffolds promoted cell adhesion, proliferation and spreading, the CHA/PHBV scaffolds exhibited a significantly higher ALP activity of SaOS-2 cells than the PHBV scaffolds, therefore, suggesting that the presence of CHA nanospheres in electrospun CHA/PHBV nanocomposite fibers was useful for encouraging the expression of ALP activity of the cells. Zhang et al. studied porous nHA/PCL spiral scaffolds with different weight ratios of nHA and PCL, to find out if biological activities of human fetal osteoblasts (hFOBs) are nHA dose dependent . 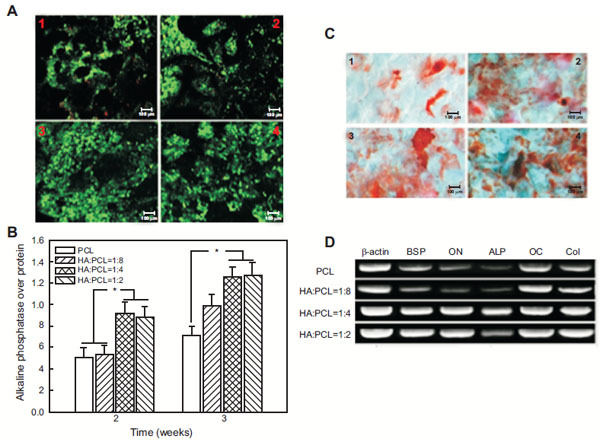 The authors reported that these scaffolds supported hFOBs adhesion, viability and proliferation but what was interesting to notice was that ALP activity and mineralised matrix synthesis of these cells were significantly increased on the nHA/PCL scaffolds compared to the pristine control. LIVE/DEAD staining revealed significantly higher cell viability on nHA:PCL = 1:4 scaffolds and nHA:PCL = 1:2 scaffolds than on nHA:PCL = 1:8 scaffolds and PCL (Fig. 3A). ALP assay showed that ALP activity was significantly higher in the nHA:PCL= 1:4 and nHA:PCL = 1:2 spiral scaffolds compared to nHA:PCL = 1:8 and PCL spiral scaffolds (p>0.05) (Fig. 3B). Moreover, qualitative Alizarin S Red staining of calcium deposition assay showed that the nHA/PCL spiral scaffolds had a higher average calcium deposition than that on the PCL spiral scaffolds (p>0.05) (Fig. 3C). Using polymerase chain reaction, the authors also studied the osteoblastic cell differentiation on mRNA level and found a similar trend whereby nHA/PCL nanocomposite scaffolds had a higher level of osteogenic differentiation markers in an nHA dose dependent manner (Fig. 3D). Fig. (3). Investigation into the in vitro effect of nHA nanoparticles on PCL: A) Cells seeded on PCL spiral scaffold (1), HA:PCL = 1:8 nano-HA/PCL spiral scaffold (2), HA:PCL = 1:4 nano-HA/PCL spiral scaffold (3), HA:PCL = 1:2 nano-HA/PCL spiral scaffold (4) for 7 days. Live cells were stained green, dead cells were stained red and nucleus were stained blue; B) ALP expression on the nano-HA/PCL spiral scaffolds (normalised against protein concentration) after 2 and 3 weeks in vitro. Data represent the mean ± standard deviation, n = 6. Significant difference between different material groups were denoted as * (p<0.05); C) Alizarin S Red staining of cells cultured on PCL spiral scaffold (1), HA:PCL = 1:8 nano-HA/PCL spiral scaffold (2), HA:PCL = 1:4 nano-HA/PCL spiral scaffold (3), HA:PCL = 1:2 nano-HA/PCL spiral scaffold (4) for 21 days; D) Gene expression of osteogenic markers in nano-HA/PCL spiral scaffolds analysed using representative electrophoresis gel after 3 weeks in culture . Furthermore, Selvakumar et al. researched mechanical properties, osteoconductivity and biocompatibility of two types of 2-dimensional (2-D) rod-like nHA (unmodified and polypropylene glycol (PPG) wrapped) incorporated into thermoplastic polyurethane (TPU) matrices based on polycarbonate soft segments both in-situ and ex-situ . The authors reported of enhanced osteoconductivity of the nanocomposites by successful formation of an apatite layer on the surface of the scaffolds, after immersion into SBF. They also investigated the in vitro bioactivity of nanocomposites by incubating the scaffolds in SBF solution with ion concentrations equal to human blood plasma and quantitatively examined apatite layer formation on the surface the scaffolds. It was shown that the nHA-filled TPU nanocomposites prepared by the in situ technique had an abrupt change in the apatite layer formation compared to pristine TPU. Natural bone has an architectural design consisting of nanoscale to macroscopic dimensions, which provide it with stable mechanical properties. In order to mimic the nanostructure in natural ECM and mechanical characteristics of the natural bone, vast research has focused on manipulating polymeric scaffolds at the nanostructure dimension, for instance by incorporation of nanoparticles, nanotubes and nanofibers into the polymer matrix . As discussed, nHA has low strength and toughness due to its poor sinterability, however, these drawbacks can be overcome by designing a nanocomposite in which nHA would provide excellent bioactivity and osteoconductivity and the polymer would offer the necessary mechanical strength to the brittle nHA and the scaffold as a whole. Such nanostructured materials, due to high surface energy, could potentially have all the requirements needed for particular applications in bone tissue engineering. Incorporation of nHA into a polymer matrix can have various effects on the mechanical properties of the construct depending on different factors including but not limited to; the structure/morphology of nHA, method of dispersion and the size and the concentration of the nanoparticles. Fig. (4). Mechanical properties, aggregate/cluster formation and biodegradability of SP nanocomposites with different nHA content: A)Tensile modulus of SP nanocomposites with different nHA content; B) Tensile strength of SP nanocomposites with different nHA content; C) Top new aggregate/cluster formation between PCL(UPy)2 and HApUPynano-particles in supramolecular nano-composites; bottom temperature stability of the supramolecularly assembled aggregates/ clusters; D) biodegradability evaluation in terms of hardness and moduli data of the 60/120 days incubated samples in comparison with fresh samples (a and b), the MTT viability test on PBS solutions equilibrated with the neat PCL(UPy)2, PU10 and PH10 and pure PBS solution (c). Fresh PBS solution and culture medium were used as controls. The viability of rBMSCs in culture medium (DMEM) was set at 100% . Liu et al. investigated dispersion of nHA in PLGA and its effect on mechanical properties compared to composites with agglomerated ceramic nanoparticles . The authors demonstrated that well-dispersed nHA in PLGA significantly improved mechanical properties, in specific the tensile modulus, tensile stress at yield, ultimate tensile strength and compressive modulus of the constructs. This consequently led to greater osteoblast functions vital for bone regeneration. Nathanael et al. studied nHA nanorods reinforced with high molecular weight polyethylene (HMWPE) and found that the tensile strength and the abrasion resistance were improved in these scaffolds compared to pure HMWPE specimen and nHA . The authors also reported that the mechanical strength and the homogeneous mixing with the polymer matrix were also dependent on the particle size and shape, in a manner by which the smaller size nanorod particles provided a well homogenous mixture of HA and HMWPE and consequently better mechanical strength. Furthermore, Sajjadi et al. researched the role of nHA concentration on the mechanical properties of polymethylmethacrylate/nHA (PMMA/nHA) nanocomposites by homogenously distributing increasing concentrations of nHA (0, 2.5, 5, & 10 wt% nHA) into PMMA . The authors observed that increased nHA concentration decreased wear rate in both atmosphere and artificial saliva, as the presence of nHA has high hardness that can improve sliding wear rate. However, they did not observe any direct proportionality between the results of compression tests and the HA content and the addition of up to 10% wt nHA to PMMA did not affect the bending properties significantly. Shokrollahi et al. recently studied the effect of interfacial interactions of nHA and synthetic PCL matrix in terms of the mechanical properties and biodegradation of the nanocomposite . 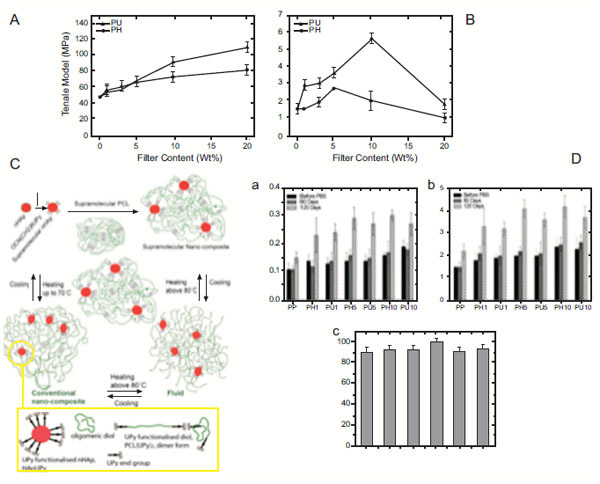 To do this, the authors prepared nHA/ureido pyrimidinone (HApUPy) hybrid biocomposites composed of surface-modified nHA and supramolecular PCL (SP PCL) at different compositions and evaluated their mechanical, thermal and viscoelastic properties as well as biodegradability, biocompatibility and cytotoxicity in vitro and compared to SP PCL/naked hydroxyapatite nano-composites. They showed that surface modification of nHA resulted in significant improvement of tensile strength and modulus of the nanocomposite of up to 3.6 and 2.2–fold, respectively (Fig. 4A & B). It was also demonstrated that formation of microphase, due to separation of supramolecular clusters around the modified surface of nHA nanoparticles, was responsible for the significant improvement in mechanical properties at room temperature (Fig. 4C). Moreover, nano-indentation measurements revealed that the hardness and moduli of the nanocomposites increased with increasing concentration of nHA (Fig. 4Da & b) as the nHA bioceramic nanofiller incorporation into the polymer enhanced the strength of the scaffolds. In vitro culturing showed no toxic effects on mesenchymal stem cells (Fig. 4Dc). Jiang et al. explored a novel method of surface-grafting for nHA incorporated into PLGA and investigated the effect of such surface modification on the dispersion of nHA and the enhancement of mechanical properties of the polymer . The authors reported of a new method of surface-grafting D, L-lactide (DLLA) for nHA with the help of citric acid. 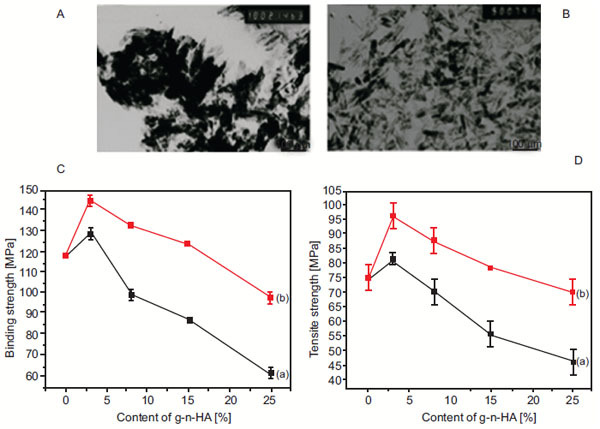 Investigation into the dispersion of the modified nHA (g1-n-HA) and the mechanical enhancement effect of this method on PLGA revealed that the use of citric acid increased grafting amount and improved dispersion of nHA compared to surface-grafting of nHA without citric acid, as unmodified nHA nanoparticles formed aggregation phenomenon in dichloromethane, but the dispersion of g1-n-HA are obviously improved after surface-grafting with citric acid (Fig. 5A & B). Interestingly, their research also showed a remarkable 20% improvement on the bending strength and tensile strength of nHA/PLGA scaffolds modified with citric acid compared to pure PLGA with 3 wt% nHA. Even with 15 wt% nHA, pure PLGA had 8 and 6% lower bending strength and tensile strength, respectively, compared to DLLA/citric acid modified nHA/PLGA scaffolds. Furthermore, assistance of citric acid for surface modification showed better mechanical properties compared to nHA/PLGA scaffolds with the nHA modified without the use of citric acid (Fig. 5C & D). Based on their findings, Jiang et al. proposes that nHA/PLGA scaffolds prepared using their novel method has a great potential in bone fracture internal fixation application in the future. Fig. (5). Internal structure imaging and mechanical properties profiling of different g-n-HA content: A) Transmission electron microscopy images of unmodified n-HA; B) Transmission electron microscopy images of g1-n-HA; C) Mechanical properties (bending strength) of different g-n-HA content; D)) Mechanical properties (tensile strength) of different g-n-HA content (red curve is g1-n-HA, and black curve is g2-n-HA) . As discussed earlier, scientific research, through extensive physiochemical characterisation, in vitro and in vivo assessment, has brought together the optimum characteristics of nHA and various types of synthetic polymers in order to develop nanocomposites of suitable nature for bone tissue engineering (Table 3). Most if not all of these efforts have been put into place in order to develop, design and manufacture an end product suitable for human clinical applications. For instance, nHA/synthetic polymers of suitable nature have become candidates of enormous potentials as bone graft substitutes, or as a coating materials for dental and orthopaedic implants [73-75]. Statistical reports show that every year around the world, approximately 15 million bone fractures occur , of which up to 10% fail to heal completely and hence lead to complications of non-union healing [77, 78]. Commonly, non-union fractures are characterised by the significant gap between the fracture bone ends, which would not naturally close unless a platform is introduced surgically to act as a temporary support and to bridge this distance . This is where synthetic nHA/polymer bone graft substitutes come into play a significant role in clinical applications and as an alternative for allografts and autografts currently used. Most of the bone graft substitutes used in clinical applications are granules (0.1 to 5 mm in diameter) or porous blocks . In some cases, bone graft substitutes come in the form of injectable with the ability to harden after implantation in situ or injection. Others come in the form of a mesh or a paste that cannot be hardened. The latter type consist of the granules and a highly viscous hydrogel “glue” [79, 80]. As a coating agent nHA/synthetic polymer constructs are able to form a sintered apatite layer to create a tight and durable bonding between the implant/prosthesis (of various material e.g. metals or polymers) and the living bone tissue . Liu et al. and Pepla et al. have done comprehensive reviews on the nature, design, development, advantageous and disadvantages of such scaffolds for specific clinical applications [40, 78]. Table 3. The most recent and significant studies on degradation profile, osteoconductivity and mechanical properties of synthetic nanohydroxyapatite incorporated into various types of synthetic polymers. Degradation Dong et al. (2009)  nHA/PU Foaming SBF, in vitro, in vivo SBF test indicated that urethanes degrade through chemical breakage of castor oil followed by the hydrolysis of urethane bonds joining the hard and soft segment. in vivo degradation of the construct was mainly due to the enzyme digestion of n-HA. Han et al. (2013)  PLLA, NF-PLLA & nHA/NF-PLLA Thermally induced phase separation Physiochemical & in vitro Nanofibrous poly(L-lactide) and nHA/poly(L-lactide) had a significantly faster degradation rate, due to their much larger SSA, compared to poly(L-lactide). Huang et al. (2013)  nHA/ PLLA Melt blending In vitro nHA/PLLA scaffold had a slower rate of degradation than the PLLA scaffold. The nHA/PLLA material sustained its initial mechanical strength better than the pure PLLA scaffold. Solution By forming a physical barrier, the nHA nanoparticles decreased the rate of degradation of PLLA scaffolds. Osteoconductivity Tong et al. (2011)  Electrospun PHBV & CHA/PHBV Nanomulsion/electrospinning In vitro CHA/PHBV scaffolds exhibited a significantly higher ALP activity of SaOS-2 cells than the PHBV scaffolds, therefore, suggesting that the presence of CHA nanospheres in electrospun CHA/PHBV nanocomposite fibers was useful for encouraging the cells for the expression of ALP activity. Fu et al. (2012)  PCEC & nHA/PCEC Melt blending/ electrospinning In vitro & in vivo The nHA/PCEC composite scaffolds, implanted in 12 New Zealand white rabbits, had a higher ability to promote guided bone regeneration than that of self-healing control group with no implant. Zhang et al. (2014)  PCL & nHA/PCL Air drying/coagulation In vitro Scaffolds supported hFOBs adhesion, viability and proliferation but ALP activity and mineralised matrix synthesis of these cells was significantly increased on the nHA/PCL scaffolds compared to pristine control. nHA/PCL nanocomposite scaffolds had a higher level of osteogenic differentiation markers and the effect was nHA dose dependent. Selvakumar et al. (2015)  TPU & nanorods nHA/TPU non-ionic surfactant & in situ In vitro Enhanced osteoconductivity of the nanocomposites by successful formation of an apatite layer on the surface of the scaffolds was reported after immersion into SBF. Mechanical Properties Liu et al. (2010)  nHA/PLGA & Wet chemistry precipitation Physiochemical Well-dispersed nHA in PLGA significantly improved tensile modulus, tensile stress at yield, ultimate tensile strength and compressive modulus of the constructs. 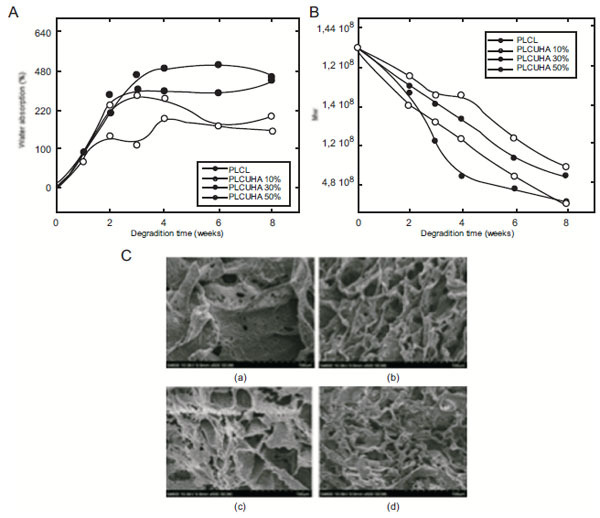 moulding Physiochemical Studied nHA nanorods reinforced with high molecular weight polyethylene (HMWPE) and found that the tensile strength and the abrasion resistance were improved in these scaffolds compared to pure HMWPE specimen and nHA. Sajjadi et al. (2011)  nHA/PMMA & PMMA Compression molding Physiochemical It was shown that increased nHA concentration of PMMA/nHA scaffolds decreased wear rate in both atmosphere and artificial saliva, as the presence of nHA has high hardness that can improve sliding wear rate. et al. (2014)  HApUPy & SP PCL/naked nHA Drying under reduced pressure Physiochemical & in vitro Unusually improved mechanical properties were observed in nHA/PCL scaffolds which was explained by the formation of supramolecular clusters around nHA nanoparticles. Jiang et al. (2014)  Unmodified nHA/PLGA, g1-n-HA & g2-n-HA Surface grafting DLLA with and without citric acid Physiochemical A novel method of surface-grafting for nHA incorporated into PLGA showed a 20% improvement on the bending strength and tensile strength of nHA/PLGA scaffolds modified with citric acid compared to pure PLGA with 3 wt% nHA. One of the main clinical applications of nHA/synthetic polymer constructs, either as building material, bone graft substitute or as a coating agent, is in spinal fusion surgery . Spinal fusion is a motion eliminating procedure where two vertebrae are fused together by introducing bone grafts to promote bone growth. Autogenous iliac crest graft is considered the “gold standard” bone graft for spinal fusion [83, 84]. However, due to the limitations and drawbacks of this type of bone grafts, synthetic nHA/polymer bone graft substitutes are becoming more and more popular. The process of bone fusion can be further supported and encouraged by using plates, screw, rods and/or cages of suitable types and sizes. One of the most commonly used instrument in spinal fusion surgeries is the cage, a device designed by Bagby et al. with a hollow cylindrical structure to overcome the risks of donor site morbidity associated with iliac crest grafts . It is referred to as “cage” as this device has been designed to allow bone graft to be placed inside its hollow structure. The first cage was made out of stainless steel, however, it was gradually replaced by the titanium mesh cage due to the excellent mechanical properties and preferable clinical outcomes of titanium [84, 86]. In the recent years, nHA/synthetic polymers, due to their stress shielding, mechanical properties, osteoconductivity, bioactivity and degradability, have been used as building material for spinal fusion cages . Yang et al. investigated nHA/polyamide-66 (nHA/PA66) cage, a hollow cylindrical device consisting of nanoparticle HA and polyamide-66 for single level anterior cervical discectomy and fusion (ACDF) (Fig. 6A) . Forty seven consecutive patients (mean age of 47.7 years) with radiculopathy or myelopathy were the subjects of this investigation into each of whom a nHA/PA66 cage was placed in a single level ACDF procedure (Fig. 6B). Patients were divided into two groups; Group A) those who had been fused using nHA/PA66 cage with pure local bone graft (n= 27) and Group B) those who had been fused using nHA/PA66 cage with hybrid bone grafts (n= 20). The segmental lordosis and intervertebral disc height was measured on each patient preoperative using radiographs. The loss of segmental lordosis correction and spinal cage subsidence was measured over a two year follow-up period. The mean correction of segmental lordosis from surgery, the mean loss of correction, the mean cage subsidence and the rate of cage subsidence (>2 mm) were 6.9 ± 3.0°, 1.7 ± 1.9°, 1.2 ± 0.6 mm and 2%, respectively. The authors reported a 100% rate of fusion success (Fig. 6C) and no significant difference amongst the two groups. This cage was found to have a low modulus of elasticity (5.6 GPa), a measure which is significantly lower than that of the bone graft (12 GPa). This is an important finding as the lower modulus of a cage can help to decrease stress shielding and consequently encourages early osseous fusion. Interestingly, it was observed that by implanting the nHA/PA66 cage in patients and by the nHA of the cage coming into contact with the surrounding body fluids, a process of micro-ion-exchange of Ca2+ and PO43 took place in the interbody space that formed a crystal layer on the surface of the cage, which assisted the creeping growth of bone graft. Based on these and also due to a high rate of success and a low rate of subsidence, as well as the radiolucency of this cage (allowing for clear X-ray film and CT scans to assess osseous fusion or spinal decompression status), the authors concluded that the nHA/PA66 cage is a suitable reconstructing instrument for patients undergoing ACDF. In a separate study, Xu et al. investigated the safety and efficiency of porous nHA/PA66 cage in rabbits and report primary use in cervical discectomy and fusion . nHA/PA66 biocomposite with a high compressive strength (13-46 MPa) and excellent porosity (pore size of 280-500 µm and porosity of 36-57%) was used to manufacture columnar nHA/PA66 blocks (height of 10 mm and diameter of 5 mm). Thirty New Zeeland white rabbits, each with four defect holes previously drilled in the femur, were used as animal models in each of which two nHA/PA66 blocks were introduced and the other two defects were left empty. The rabbits were divided into three groups depending on the sacrifice time (4, 12 and 24 weeks). All subjects survived until the end of their sacrifice period with good wound healing and no complication was encountered during the postoperative period. Macroscopic observation of the defects at the end of week 4 should 70% of the surface of the implant covered with callus formation and very few calluses observed in the blank control defects. At the end of 12 weeks the defects with the implants showed near complete surface coverage of the cage by callus but fewer calluses in the blank control. At twentieth week natural bone had covered the defect in the nHA/PA66 groups, whereas in the other group only thin callus was observed. From these findings, authors concluded that nHA/PA66 biocomposite, due to the bioactivity of nHA and the construct excellent porosity, connectivity, pore size and compressive strength could provide good support as bone graft substitute during the bone healing process. Furthermore, the irregular shape of the blocks provided a good interface between the bone graft substitute and the host bone, hence allowing the new bone tissue to survive in the interconnected pores. More importantly, since just after four weeks new bone was formed around the implant and inside the pores, the good osteoconductivity of the bone substitute was evident. Furthermore, for the primary clinical study, a prospective non-random compared study of 60 patients with cervical spondylosis myelopathy or radiculopathy who underwent ACDF with cage and anterior plate was conducted. Here, the anterior fusion was carried out using nHA/PA66 cage in thirty of the patients and PEEK cage in the remaining thirty. Complete datasets (preoperative, immediately, postoperative and 3 & 6 months follow-up) were obtained for 57 out of 60 patients eligible for inclusion. Out of this 57 patients, 29 underwent the ACDF with PEEK cage and 28 patients with nHA/PA66 cage. There were no serious complications in either of the two groups and radiographic analysis showed no cage migration or breakage for either of the groups at the end of 6 months follow-up period. At the end of 3 month follow-up period, the nHA/PA66 group showed a higher rate of fusion (93%) compared to that of the PEEK group with 83% successful fusion rate. The two group showed 100% fusion rate at the end of the 6 month follow-up period. The authors concluded that nHA/PA66 bone graft was highly safe and effective in repairing bone defects of rabbits. Furthermore, the porous nHA/PA66 cage was effective when used in ACDF and had a good outcome, however, the follow-up period was short to draw any conclusions for the long-term success of the cage. Fig. (6). 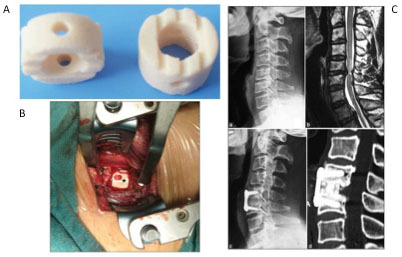 Outcome of single level anterior cervical discectomy and fusion using nanohydroxyapatite/polyamide-66 cage: A)Hollow cylinder n-HA/PA66 cage with wide rims and several shallow recesses designed to avoid subsidence and migration; B) Implantation of n-HA/PA66 cage (Black asterisk denotes the cage); C) Preoperative lateral radiograph of cervical spine of a cervical myelopathy due to C5/6 disc herniation (a), Preoperative cervical T2W MRI cervical spine sagittal cut showing prolapse of C5-6 disc associated with edema signal of the spinal cord (b), Postoperative x-ray cervical spine lateral view three years followup showing anterior discectomy and fusion (c), Sagittal reconstruction computed tomography scans at three years followup showing good level of fusion (d) . As mentioned earlier, nHA/synthetic polymer nanocomposites can be used as coating materials for dental and orthopaedic implants. PEEK has been frequently used in spinal fusion surgery and has demonstrated good clinical results. Its chemical resistance, mechanical properties and radiolucency has made PEEK a suitable replacement for metal implants . Moreover, metal implants have significantly high elastic modulus (e.g. commercially pure titanium E= 114 GPa), whereas PEEK has an elastic modulus of 3.2 GPa, which is a value in between that of the cortical and cancellous bone, hence has more potential to match the host tissue. Despite these advantages of PEEK, this material is bioinert and hydrophobic and has poor osseointegration in its pure form [89, 90]. To overcome these shortcomings incorporation of nHA into PEEK has been considered, which successfully increased bone incorporation, however, some studies have reported of reduced mechanical properties or physical bonding between the implanted and the coated layer of nHA [91-94]. Very recently, Johansson et al. reported of a use of unique coating procedure that creates a very thin layer of nHA coating (20-40 nm) and investigated the biological effects of nHA coating on PEEK implants in a rabbit model. Briefly, nHA dispersion was applied to the implants by spin coating followed by 10 minutes drying at room temperature . The coated implants were then treated with heat to increase nHA crystals adherence to the polymer surface. In vivo study showed a significant improvement in early bone integration for nHA coated PEEK implants, compared to uncoated PEEK implants probably due to the up-regulatory effect of dissolutioned nHA ions on osteoblast activity. The study may be of clinical interest for coatings of instruments/implants of load-bearing nature which lack bioactivity, bone integration and osseointegration abilities to ensure the long term success of the implant and avoid repeated surgical treatments. In the search for an ideal scaffold for bone tissue engineering, incorporation of nHA into synthetic polymers has shown promising bioactivity, osteoconductivity and mechanical properties compared to other techniques previously considered. Great deal of research has focused on the different avenues of incorporation of these two materials together and various types of nHA/synthetic polymer nanocomposites, with enhanced in vitro and in vivo characteristics have been developed. However, most of these nanocomposites lack the necessary requirements for human applications. This is mainly because in vitro and in vivo experiments have limited abilities to simulate what would eventually happen to the scaffold once implanted in humans. Furthermore, most clinical trials of scaffolds constructed from nHA/synthetic polymers have only been investigated for a short follow-up period (on average up to two years). This could be sufficient for constructs of degrading nature, however, those of non-degradable nature require longer follow-up period in order to determine the success or failure of the implant. Another issue worth noting is that most of the research focus has been placed on biodegradable scaffolds. This could be of an issue for cases where bone defect is much larger than average and in cases where the degradation rate of the scaffold does not match the rate of bone growth. To overcome this issue, non-degradable scaffolds can be employed whereby permanent support can be provided to restore the functionality of the defected bone. A potentially suitable candidate for such an application could be nHA incorporated polyhedral oligomeric silsesquioxane poly(carbonate-urea) urethane (POSS-PCU) nanocomposite. POSS-PCU is a novel polymer with enhanced biocompatibility, superior mechanical engineering properties, and augmented degradative resistance, all of which render it capable of functioning as a scaffold for nanoparticles loading for biomedical applications, a suitable coating for medical devices and bioartificial organs [96, 97]. POSS-PCU, due to its desirable properties, has already been successfully implemented in humans in the form of bypass graft, lacrimal duct and most notably, as the world's first synthetic trachea [96, 98, 99]. Incorporation of POSS-PCU with nHA would offer great benefits both in terms of the overall mechanical strength of the nanocomposite and enhanced material-cell response, mediated by POSS-PCU and nHA, respectively. Developed at our research centre, nHA/POSS-PCU nanocomposite (at different nHA concentrations) has been investigated for bone tissue engineering purposes (such as bone graft substitutes, implant coating or guided bone regeneration (GBR)) and potentially promising in vitro results in terms of SaOS-2 osteogenic cells attachment, proliferation and bone mineralisation have been achieved (results unpublished). As discussed, nHA based nanocomposites have already shown promising in vitro, in vivo and clinical results, therefore, their translation for human applications is bound to expand in the near future. One interesting factor to further improve the clinical use of these materials is their enhanced interaction with mesenchymal stem cells [100, 101]. Stem cells are playing a crucial role in furthering the achievements in the field of bone tissue engineering and regeneration with clinical translation as the end goal. As the results, we aim to investigate the material-cell interaction of nHA/POSS-PCU nanocomposites with mesenchymal stem cells. It is anticipated, from previous in vitro and in vivo growth of stem cells on POSS-PCU, that the physicochemical and biological properties of these nanocomposite scaffolds could further enhance mesenchymal stem cells differentiation towards osteoblast lineage for dental and orthopaedic applications [102-104]. We certify that there are no conflicts of interests with any financial organisation regarding the material discussed in this manuscript. No funding was received in support of this study. Baroli B. From natural bone grafts to tissue engineering therapeutics: Brainstorming on pharmaceutical formulative requirements and challenges. J Pharm Sci 2009; 98(4): 1317-75. Finkemeier CG. Bone-grafting and bone-graft substitutes. J Bone Joint Surg Am 2002; 84-A(3): 454-64. Soucacos PN, Johnson EO, Babis G. An update on recent advances in bone regeneration. Injury 2008; 39(Suppl. 2): S1-4. Dimitriou R, Jones E, McGonagle D, Giannoudis PV. Bone regeneration: current concepts and future directions. BMC Med 2011; 9: 66. Banwart JC, Asher MA, Hassanein RS. Iliac crest bone graft harvest donor site morbidity. A statistical evaluation. Spine 1995; 20(9): 1055-60. Ebraheim NA, Elgafy H, Xu R. Bone-graft harvesting from iliac and fibular donor sites: techniques and complications. J Am Acad Orthop Surg 2001; 9(3): 210-8. St. John TA, Vaccaro AR, Sah AP, et al. Physical and monetary costs associated with autogenous bone graft harvesting. Am J Orthop 2003; 32(1): 18-23. Palmer W, Crawford-Sykes A, Rose RE. Donor site morbidity following iliac crest bone graft. West Indian Med J 2008; 57(5): 490-2. DeCoster TA. Low morbidity reported after iliac bone-graft harvesting: commentary on an article by Bryan J. Loeffler, MD, et al. : "Prospective observational study of donor-site morbidity following anterior iliac crest bone-grafting in orthopaedic trauma reconstruction patients". J Bone Joint Surg Am 2012; 94(18): e139(1-2). Li J, Zhang L, Lv S, Li S, Wang N, Zhang Z. Fabrication of individual scaffolds based on a patient-specific alveolar bone defect model. J Biotechnol 2011; 151(1): 87-93. Jain RK, Au P, Tam J, Duda DG, Fukumura D. Engineering vascularized tissue. Nat Biotechnol 2005; 23(7): 821-3. Bramfeldt H, Sabra G, Centis V, Vermette P. Scaffold vascularization: a challenge for three-dimensional tissue engineering. Curr Med Chem 2010; 17(33): 3944-67. Maquet V, Jerome R. Design of macroporous biodegradable polymer scaffolds for cell transplantation. Mater Sci Forum 1997; 250: 15-42. Venkatesan J, Kim SK. Nano-hydroxyapatite composite biomaterials for bone tissue engineeringa review. J Biomed Nanotechnol 2014; 10(10): 3124-40. Sheikh Z, Najeeb S, Khurshid Z, et al. Biodegradable materials for bone repair and tissue engineering applications. Materials (Basel) 2015; 8(9): 5744-94. Zhou H, Lee J. Nanoscale hydroxyapatite particles for bone tissue engineering. Acta Biomater 2011; 7(7): 2769-81. Asti A, Gioglio L. Natural and synthetic biodegradable polymers: different scaffolds for cell expansion and tissue formation. Int J Artif Organs 2014; 37(3): 187-205. Polo-Corrales L, Latorre-Esteves M, Ramirez-Vick JE. Scaffold design for bone regeneration. J Nanosci Nanotechnol 2014; 14(1): 15-56. Wu SL, Liu X, Yeung KWK, et al. Biomimetic porous scaffolds for bone tissue engineering. Mater Sci Eng Rep 2014; 80: 1-36. Wan Y, Xiao B, Dalai S, Cao X, Wu Q. Development of polycaprolactone/chitosan blend porous scaffolds. J Mater Sci Mater Med 2009; 20(3): 719-24. Thadavirul N, Pavasant P, Supaphol P. Development of polycaprolactone porous scaffolds by combining solvent casting, particulate leaching, and polymer leaching techniques for bone tissue engineering. J Biomed Mater Res A 2014; 102(10): 3379-92. Gentile P, Chiono V, Carmagnola I, Hatton PV. An overview of poly(lactic-co-glycolic) acid (PLGA)-based biomaterials for bone tissue engineering. Int J Mol Sci 2014; 15(3): 3640-59. Zong C, Qian X, Tang Z, et al. Biocompatibility and bone-repairing effects: comparison between porous poly-lactic-co-glycolic acid and nano-hydroxyapatite/poly(lactic acid) scaffolds. J Biomed Nanotechnol 2014; 10(6): 1091-104. Chang W, Mu X, Zhu X, et al. Biomimetic composite scaffolds based mineralization of hydroxyapatite on electrospun calcium-containing poly(vinyl alcohol) nanofibers. Mater Sci Eng C Mater Biol Appl 2013; 33(7): 4369-76. Linh NT, Lee KH, Lee BT. Functional nanofiber mat of polyvinyl alcohol/gelatin containing nanoparticles of biphasic calcium phosphate for bone regeneration in rat calvaria defects. J Biomed Mater Res A 2013; 101(8): 2412-23. Mi H-Y, Palumbo S, Jing X, Turng LS, Li WJ, Peng XF. Thermoplastic polyurethane/hydroxyapatite electrospun scaffolds for bone tissue engineering: effects of polymer properties and particle size. J Biomed Mater Res B Appl Biomater 2014; 102(7): 1434-44. Mi HY, Jing X, Salick MR, et al. 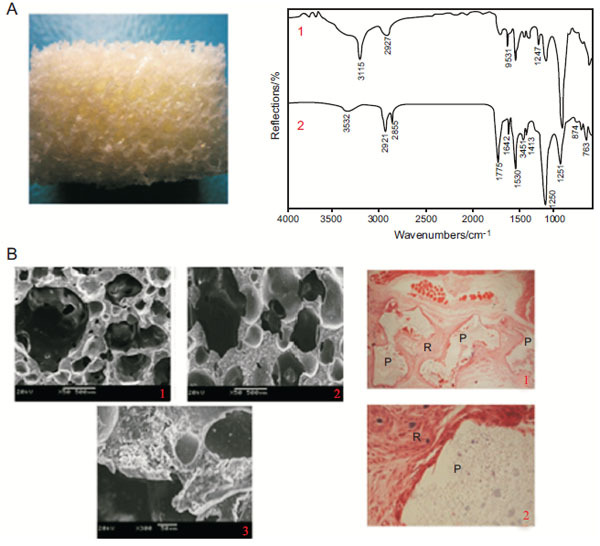 Morphology, mechanical properties, and mineralization of rigid thermoplastic polyurethane/hydroxyapatite scaffolds for bone tissue applications: effects of fabrication approaches and hydroxyapatite size. J Mater Sci 2014; 49(5): 2324-37. Edwards SL, Werkmeister JA. Mechanical evaluation and cell response of woven polyetheretherketone scaffolds. J Biomed Mater Res A 2012; 100(12): 3326-31. Wang L, He S, Wu X, et al. Polyetheretherketone/nano-fluorohydroxyapatite composite with antimicrobial activity and osseointegration properties. Biomaterials 2014; 35(25): 6758-75. Habraken WJ, Wolke JG, Jansen JA. Ceramic composites as matrices and scaffolds for drug delivery in tissue engineering. Adv Drug Deliv Rev 2007; 59(4-5): 234-48. Swetha M, Sahithi K, Moorthi A, Srinivasan N, Ramasamy K, Selvamurugan N. Biocomposites containing natural polymers and hydroxyapatite for bone tissue engineering. Int J Biol Macromol 2010; 47(1): 1-4. Matsumoto T, Okazaki M, Inoue M, Hamada Y, Taira M, Takahashi J. Crystallinity and solubility characteristics of hydroxyapatite adsorbed amino acid. Biomaterials 2002; 23(10): 2241-7. Gonzalez-McQuire R, Chane-Ching J-Y, Vignaud E, et al. Synthesis and characterization of amino acid-functionalized hydroxyapatite nanorods. J Mater Chem 2004; 14(14): 2277-81. Luo P, Nieh TG. Synthesis of ultrafine hydroxyapatite particles by a spray dry method. Mater Sci Eng C 1995; 3(2): 75-8. Fox K, Tran PA, Tran N. Recent advances in research applications of nanophase hydroxyapatite. ChemPhysChem 2012; 13(10): 2495-506. Pepla E, Besharat LK, Palaia G, Tenore G, Migliau G. Nano-hydroxyapatite and its applications in preventive, restorative and regenerative dentistry: a review of literature. Ann Stomatol (Roma) 2014; 5(3): 108-14. LeGeros RZ. Biodegradation and bioresorption of calcium phosphate ceramics. Clin Mater 1993; 14(1): 65-88. Gardin C, Ferroni L, Favero L, et al. Nanostructured biomaterials for tissue engineered bone tissue reconstruction. Int J Mol Sci 2012; 13(1): 737-57. Supová M. Problem of hydroxyapatite dispersion in polymer matrices: a review. J Mater Sci Mater Med 2009; 20(6): 1201-13. Jiang L, Jiang L, Xu L, et al. Effect of a new surface-grafting method for nano-hydroxyapatite on the dispersion and the mechanical enhancement for poly (lactide-co-glycolide). Express Polym Lett 2014; 8(2): 133-41. Maiti SK. Electron transport through molecular bridge systems. J Nanosci Nanotechnol 2008; 8(8): 4096-100. Mathieu LM, Bourban PE, Månson JA. Processing of homogeneous ceramic/polymer blends for bioresorbable composites. Compos Sci Technol 2006; 66(11–12): 1606-14. Sung H-J, Meredith C, Johnson C, Galis ZS. The effect of scaffold degradation rate on three-dimensional cell growth and angiogenesis. Biomaterials 2004; 25(26): 5735-42. Rumpel E, Wolf E, Kauschke E, et al. The biodegradation of hydroxyapatite bone graft substitutes in vivo. Folia Morphol (Warsz) 2006; 65(1): 43-8.
 de Groot K. Clinical usefulness of calcium phosphate ceramics. Zahnarztl Mitt 1985; 75(18): 1938-40. Blair HC. How the osteoclast degrades bone. BioEssays 1998; 20(10): 837-46. Müller-Mai CM, Voigt C, Gross U. Incorporation and degradation of hydroxyapatite implants of different surface roughness and surface structure in bone. Scanning Microsc 1990; 4(3): 613-22. Gomi K, Lowenberg B, Shapiro G, Davies JE. Resorption of sintered synthetic hydroxyapatite by osteoclasts in vitro. Biomaterials 1993; 14(2): 91-6. Müller-Mai CM, Stupp SI, Voigt C, Gross U. Nanoapatite and organoapatite implants in bone: histology and ultrastructure of the interface. J Biomed Mater Res 1995; 29(1): 9-18. Smolen D, Chudoba T, Malka I, et al. Highly biocompatible, nanocrystalline hydroxyapatite synthesized in a solvothermal process driven by high energy density microwave radiation. Int J Nanomedicine 2013; 8: 653-68. Fischer FD, Waitz T, Vollath D, et al. On the role of surface energy and surface stress in phase-transforming nanoparticles. Prog Mater Sci 2008; 53(3): 481-527. Meyer JL, Fowler BO. Lattice defects in nonstoichiometric calcium hydroxylapatites. A chemical approach. Inorg Chem 1982; 21(8): 3029-35. Dong Z, Li Y, Zou Q. Degradation and biocompatibility of porous nano-hydroxyapatite/polyurethane composite scaffold for bone tissue engineering. Appl Surf Sci 2009; 255(12): 6087-91. Han W, Zhao J, Tu M, et al. Preparation and characterization of nanohydroxyapatite strengthening nanofibrous poly(L-lactide) scaffold for bone tissue engineering. J Appl Polym Sci 2013; 128(3): 1332-8. Díaz E, Puerto I. In vitro degradation of PLCL/nHA biodegradable scaffolds. Polym Plast Technol Eng 2015; 54(6): 556-64. Kim S-S, Ahn KM, Park MS, Lee JH, Choi CY, Kim BS. A poly(lactide-co-glycolide)/hydroxyapatite composite scaffold with enhanced osteoconductivity. J Biomed Mater Res A 2007; 80(1): 206-15. Howe AK, Aplin AE, Juliano RL. Anchorage-dependent ERK signalingmechanisms and consequences. Curr Opin Genet Dev 2002; 12(1): 30-5. Stupp SI, Ciegler GW. Organoapatites: materials for artificial bone. I. Synthesis and microstructure. J Biomed Mater Res 1992; 26(2): 169-83. Bigi A, Boanini E, Panzavolta S, Roveri N, Rubini K. Bonelike apatite growth on hydroxyapatite-gelatin sponges from simulated body fluid. J Biomed Mater Res 2002; 59(4): 709-15. Tong HW, Wang M, Lu WW. In vitro biological evaluation of fibrous PHBV polymer and CHA/PHBV nanocomposite scaffolds developed for tissue engineering applications. Bioceram Dev Appl 2011; Article ID 110168: 3. Zhang X, Chang W, Lee P, et al. Polymer-ceramic spiral structured scaffolds for bone tissue engineering: effect of hydroxyapatite composition on human fetal osteoblasts. PLoS One 2014; 9(1): e85871. Selvakumar M, Jaganathan SK, Nando GB, Chattopadhyay S. Synthesis and characterization of novel polycarbonate based polyurethane/polymer wrapped hydroxyapatite nanocomposites: mechanical properties, osteoconductivity and biocompatibility. J Biomed Nanotechnol 2015; 11(2): 291-305. Li X, Wang L, Fan Y, Feng Q, Cui FZ, Watari F. Nanostructured scaffolds for bone tissue engineering. J Biomed Mater Res A 2013; 101(8): 2424-35. Nathanael AJ, Mangalaraj D, Chen CP, et al. Enhanced mechanical strength of hydroxyapatite nanorods reinforced with polyethylene. J Nanopart Res 2011; 13(5): 1841-53. Zebarjad SM, Sajjadi SA, Sdrabadi TE, Yaghmaei A, Naderi B. A study on mechanical properties of PMMA/hydroxyapatite nanocomposite. Engineering 2011; 3: 795-801. Shokrollahi P, Mehmanchi M, Atai M, Omidian H, Shokrolahi F. Effect of interface on mechanical properties and biodegradation of PCL HAp supramolecular nano-composites. J Mater Sci Mater Med 2014; 25(1): 23-35. Webster TJ, Massa-Schlueter EA, Smith JL, Slamovich EB. Osteoblast response to hydroxyapatite doped with divalent and trivalent cations. Biomaterials 2004; 25(11): 2111-21. Santos MH, Valerio P, Goes AM, Leite MF, Heneine LG, Mansur HS. Biocompatibility evaluation of hydroxyapatite/collagen nanocomposites doped with Zn+2. Biomed Mater 2007; 2(2): 135-41. Dutta S, Passi D, Singh P, et al. Ceramic and non-ceramic hydroxyapatite as a bone graft material: a brief review. Irish J Med Sci 2015; 184(1): 101-06. OKeefe RJ, Mao J. Bone tissue engineering and regeneration: from discovery to the clinican overview. Tissue Eng Part B Rev 2011; 17(6): 389-92. Salgado AJ, Coutinho OP, Reis RL. Bone tissue engineering: state of the art and future trends. Macromol Biosci 2004; 4(8): 743-65. Liu Y, Lim J, Teoh S-H. Review: development of clinically relevant scaffolds for vascularised bone tissue engineering. Biotechnol Adv 2013; 31(5): 688-705. Noor Z. Nanohydroxyapatite application to osteoporosis management. J Osteoporosis 2013; 2013: 679025. Bohner M. Resorbable biomaterials as bone graft substitutes. Mater Today 2010; 13(1): 24-30. Moroni A, Pegreffi F, Cadossi M, Hoang-Kim A, Lio V, Giannini S. Hydroxyapatite-coated external fixation pins. Expert Rev Med Devices 2005; 2(4): 465-71. Logroscino G, Lattanzi W. Bone substitution in spine fusion: the past, the present, and the future. In: Menchetti PP, Ed. Minimally invasive surgery of the lumbar spine. London: Springer 2014; pp. 311-31. Faldini C, Leonetti D, Nanni M, et al. Cervical disc herniation and cervical spondylosis surgically treated by Cloward procedure: a 10-year-minimum follow-up study. J Orthop Traumatol 2010; 11(2): 99-103. Yang X, Liu L, Song Y, Kong Q, Zeng J, Tu C. Outcome of single level anterior cervical discectomy and fusion using nano-hydroxyapatite/polyamide-66 cage. Indian J Orthop 2014; 48(2): 152-7. Bagby GW. Arthrodesis by the distraction-compression method using a stainless steel implant. Orthopedics 1988; 11(6): 931-4. Eck KR, Bridwell KH, Ungacta FF, Lapp MA, Lenke LG, Riew KD. Analysis of titanium mesh cages in adults with minimum two-year follow-up. Spine 2000; 25(18): 2407-15. Nouh MR. Spinal fusion-hardware construct: Basic concepts and imaging review. World J Radiol 2012; 4(5): 193-207. Xu H, Wang Y, Su X, et al. Safety and efficiency of biomimetic nanohydroxyapatite/polyamide 66 composite in rabbits and primary use in anterior cervical discectomy and fusion. Int J Polym Sci 2014; 2014: 6. Kurtz SM, Devine JN. PEEK biomaterials in trauma, orthopedic, and spinal implants. Biomaterials 2007; 28(32): 4845-69. Rabiei A, Sandukas S. Processing and evaluation of bioactive coatings on polymeric implants. J Biomed Mater Res A 2013; 101(9): 2621-9. Abu Bakar MS, Cheng MH, Tang SM, et al. Tensile properties, tension-tension fatigue and biological response of polyetheretherketone-hydroxyapatite composites for load-bearing orthopedic implants. Biomaterials 2003; 24(13): 2245-50. Fan JP, Tsui CP, Tang CY, Chow CL. Influence of interphase layer on the overall elasto-plastic behaviors of HA/PEEK biocomposite. Biomaterials 2004; 25(23): 5363-73. Converse GL, Yue W, Roeder RK. Processing and tensile properties of hydroxyapatite-whisker-reinforced polyetheretherketone. Biomaterials 2007; 28(6): 927-35. Johansson P, Jimbo R, Kozai Y, et al. Nanosized hydroxyapatite coating on PEEK implants enhances early bone formation: a histological and three-dimensional investigation in rabbit bone. Materials (Basel) 2015; 8(7): 3815-30. Barkarmo S, Wennerberg A, Hoffman M, et al. Nano-hydroxyapatite-coated PEEK implants: a pilot study in rabbit bone. J Biomed Mater Res A 2013; 101(2): 465-71. Tan A, Farhatnia Y, Seifalian AM. Polyhedral oligomeric silsesquioxane poly (carbonate-urea) urethane (POSS-PCU): Applications in nanotechnology and regenerative medicine. Crit Rev Biomed Eng 2013; 41(6): 495-513. Tan A, Farhatnia Y, Goh D, et al. Surface modification of a polyhedral oligomeric silsesquioxane poly(carbonate-urea) urethane (POSS-PCU) nanocomposite polymer as a stent coating for enhanced capture of endothelial progenitor cells. Biointerphases 2013; 8(1): 23. Chaloupka K, Motwani M, Seifalian AM. Development of a new lacrimal drainage conduit using POSS nanocomposite. Biotechnol Appl Biochem 2011; 58(5): 363-70. Crowley C, Birchall M, Seifalian AM. Trachea transplantation: from laboratory to patient. J Tissue Eng Regen Med 2015; 9(4): 357-67. Ma R, Tang T. Current strategies to improve the bioactivity of PEEK. Int J Mol Sci 2014; 15(4): 5426-45. Chan KH, Zhuo S, Ni M. Priming the surface of orthopedic implants for osteoblast attachment in bone tissue engineering. Int J Med Sci 2015; 12(9): 701-7. Huang J, Xiong J, Liu J, Zhu W, Wang D. Investigation of the in vitro degradation of a novel polylactide/Nanohydroxyapatite composite for artificial bone. J Nanomat 2013; 2013: 3. Díaz E, Sandonis I, Puerto I, Ibáñez I. In vitro degradation of PLLA/nHA composite scaffolds. J Polym Eng Sci 2014; 54(11): 2571-8. Fu S, Ni P, Wang B, et al. In vivo biocompatibility and osteogenesis of electrospun poly(ε-caprolactone)-poly(ethylene glycol)-poly(ε-caprolactone)/nano-hydroxyapatite composite scaffold. Biomaterials 2012; 33(33): 8363-71.